When the UO’s two winningest football coaches ever met at the Knight Library recently for a little blast from the past, they were reminded that recollections sometimes clash with reality. “When you see yourself on film, it’s like they say: The eye in the sky does not lie,” former coach Mike Bellotti said to his sidelines predecessor, Rich Brooks. 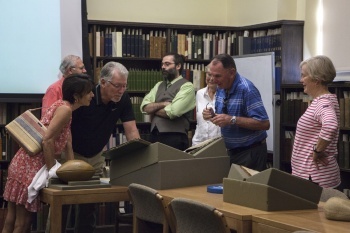 Accompanied by their spouses, Colleen Bellotti and Karen Brooks, the two coaches recently visited Special Collections and University Archives in Knight Library for a special viewing of historic athletics films, memorabilia and records. Joining them were longtime friends and athletics and UO Libraries supporters Ken Singer, who was the Ducks’ team orthopedist for 35 years; his wife Kenda; and Walt and Gretchen Barger. Walt Barger has served on the UO Libraries Advancement Council for 11 years. It was a trip down memory lane for Brooks, who led the Ducks from 1977 to 1994, and Bellotti, who succeeded Brooks in 1995 and walked the Autzen Stadium sidelines until 2008. Together they racked up more Duck wins than any other gridiron coaches. What’s more, both men are library donors. To that end, O’Neal and her colleagues in Special Collections and University Archives pulled together a selection of letters, documents, ephemera and films with the oldest materials dating back more than a century. Of course, the history of Ducks football is history that the two coaches helped make. In particular, one archival medium came to the forefront in its ability to rekindle their memories and insights: the medium of film. Brooks and Bellotti not only appeared onscreen but also at times turned out to be the films’ creators. That feeling is echoed by Lauren Goss, a UO Libraries Thomas intern who is working on a project to inspect and begin preserving the Department of Intercollegiate Athletics film collection. 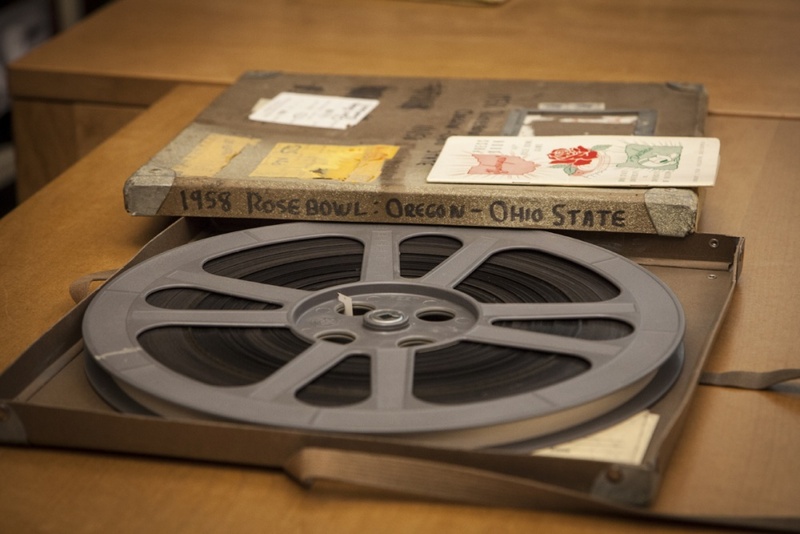 In addition to the spliced-together coaches’ film, the library screened intact footage from a number of historic Ducks games. The coaches seemed to particularly enjoy watching film of the 1948 Cotton Bowl team coached by Jim Aiken and led by Norm Van Brocklin. For Brooks, one of the films revealed a long-forgotten, personal moment. While they could not help but bring a touch of personal nostalgia to their viewing, the coaches were quick to acknowledge that researchers would approach the material from a variety of angles. Zach Bigalke, a graduate student in the department of history and archive research assistant with the UO Libraries, has worked to consolidate and catalog the intercollegiate athletics collections. In order to ensure that future students and researchers will enjoy the same access to the archived materials, the UO Libraries is engaged in an ongoing effort to raise funds for their restoration, cataloging and long-term preservation. O’Neal projects that costs will total $40,000 for the paper records and memorabilia. Assisted by Goss, Curator of Moving Images Elizabeth Peterson has estimated that the cost for the films will be approximately $1.5 million. “While the amount is significant, it is not excessive in light of the historic value of these materials,” she said.